There were quite a few card challenges I like this week. Wow, I can't believe the creativity of the card pattern designers! I do want to start by saying that all the sketches are at the bottom of the post. The first one is a standard card I did for Card Patterns. I pulled out some All Fall paper and accessories from Fancy Pants. Such cute paper to use for back-to-school cards! All product used is Fancy Pants except for the rub-ons and waxy flax. They are from CTMH. I decided to use some very different colors (at least for me) for the next card. I really stepped out of the box, and I am not sure I am comfortable with this card. But here it is made and posted! The challenge was from Inspirational Sketches, and we were to make a holiday card. I used Juniper and Tulip paper from the Perfect Day packet (CTMH). I've always been very traditional when it comes to Christmas colors and cards. I love rich reds and greens. I'm not much for the new bright colors of Christmas. However, I will never be able to say now that I didn't try something new! The stamps sets are Holiday Joy and Life's Creation from CTMH. Now we've got some All Fall paper from Fancy Pants again. The circle chipboard is from Soft Spoken. I thought this was a very inspirational card for the CPS challenge! 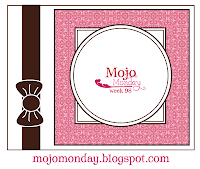 Finally, my last card is for Mojo Monday. I took some creative liberties with the sketch, but I really want to fit everything in a way I liked it. I love this stamp set - Life's Creation from CTMH. The dp is from the Perfect Day packet, and the ribbon is from my stash. They are all so beautiful but I think the first one is my fave. GREAT art. You have made wonderful works. I like the Christmas card super-duper. I am not infected at all thus with Christmas, finally, here the summer has entered, I want to enjoy the warmth still a little. Wow, you busy girl! Fabulous, I love the All Fall Cards!